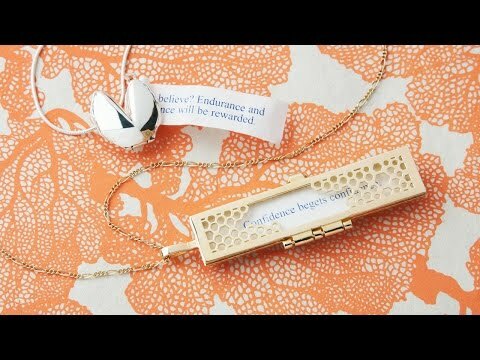 Engrave one of these thoughtful messages on this fortune pendant. The sentiment behind them is reminiscent of the classic, heirloom-y locket you might inherit and slip an old photo into—except these necklaces encourage you to look into the future as much as the past. Dimensions: Charm: 2.375" x 0.375" x 0.03"; Chain length: 30"
Do What You Love = Make sure to do what you love, not just what you're good at. 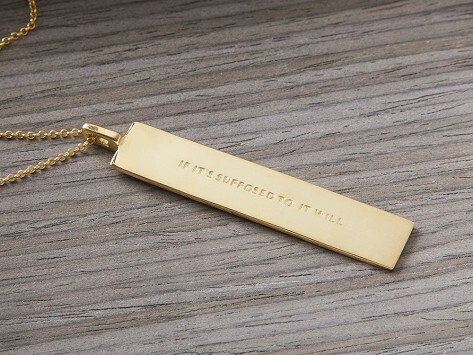 It Will = If it's supposed to, it will. Let Things Unfold = Let things unfold. Relinquish control. Love Everything = Love everything. Everything will love you back. Seeking = What you are seeking is also seeking you.